Are you under the spell of the fifth season of the Good Witch TV show on Hallmark Channel? As we all know, the Nielsen ratings typically play a big role in determining whether a TV show like Good Witch is cancelled or renewed for season six. Unfortunately, most of us do not live in Nielsen households. Because many viewers feel frustration when their viewing habits and opinions aren’t considered, we’d like to offer you the chance to rate all of the Good Witch season five episodes here. 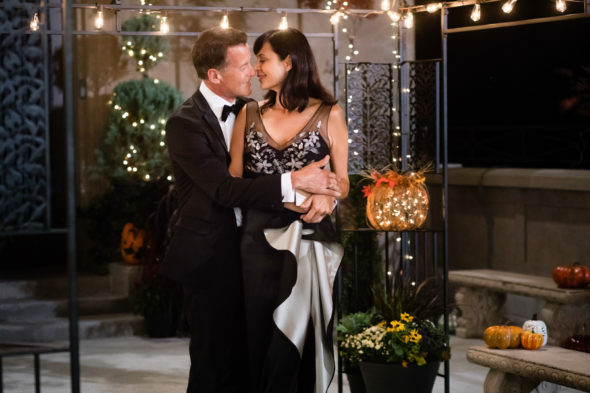 A Hallmark fantasy dramedy, Good Witch stars Catherine Bell, Bailee Madison, James Denton, Rhys Matthew Bond, Catherine Disher, and Sarah Power. The story unfolds in the town of Middleton and centers on Cassandra “Cassie” Nightingale (Bell) and her teen daughter, Grace (Madison). The two share a special intuition and are enchanting in more ways than one. Good Witch season five kicks off with the Halloween movie, Good Witch: Tale of Two Hearts. What do you think? Which season five episodes of the Good Witch TV series do you rate as wonderful, terrible, or somewhere between? Should Hallmark Channel cancel or renew Good Witch for a sixth season? Don’t forget to vote, and share your thoughts, below. I love this show! Keep them coming! I love this show. I will watch as long as they make them. So please keep them coming! I will always watch this show. Catherine Bell is dreamy. Beatifull and talented cast. LOVE the magic and fantasy in it. Just makes me feel better about life and possibilities. Exactly what I want to escape to a better place. We all need a little bit of hope. Cassie was there when I needed it the most! The positive lessons I learned about everything or about anyone, I put it on my life. Love & Magic Always! I love watching Good Witch. It’s a wonderful change from all the drama and violence we see on TV. I set my DVR to make sure to never miss an episode. It’s the one program that brings me much need joy. I do hope Good Witch continues. I only get to watch Good Witch on Netflix as Im currently awaiting this Season to appear!!!!!!! Because I dnt have the hallmark channel! I wish that it would hurry and come to netflix!!!! I juss love the realtionship between Cassie and Grace it reminds me of my relationship with my mother! They have a stong bond!!!!! Pls hurry and bring this season to netflix! Im an AVID EVERY EPISODE WATCHER AND IVE WATCHED EVERY SEASON TWICE UP TO THIS CURRENT SEASON!!!!! ANXIOUSLY WAITING THIS SEASON TO COME TO NETFLIX!!!!! PLS PLS PLS!!!!! I love the good witch….one of the best shows on TV. But was a bit disappointed that they didn’t have the wedding which I waited on and it didn’t happen. This is the second time….they were suppose to marry on the finalle last season and then was suppose to happen on the Halloween special and didn’t. Come on all ready you are disappointing the viewers. Absolutely in love with the Good Witch! A beautiful show that the whole family can watch. The setting is beautiful , the stories are engaging and the Characters are fun. I love Good Witch…..the whole family can enjoy every show. The all Good Witch Movie Marathon this past weekend… truly an enjoyable 2 days! Thank you Hallmark for continuing to bring us the quality show Good Witch. I’m fully into the fall season now after visiting Middleton. I think good witch is the best they have. But I am tired of hallmark postponing it for silly reasons. C’mon Hallmark best show you have. Let them go through with wedding. I am so glad Good Witch is back. It was a great 2 hour special. I would love to live in a town like Middleton. This is one of my favorite shows. I never miss it. Thank you Hallmark for bringing our favorite witch back. I like the good witch, but they keep putting off Cassie and Sam’s wedding. What r they waiting for! My feeling exactly..They think we will not watch it. It should be fun with the wedding and watching them have their married lives. I really enjoyed watching the show Good Witch. The 2 hour special on 10/22 /18 was awesome. Please do not cancel the series. There are many shows out there that need to be cancelled for many reasons but this one is for all ages , no bad language especially for our young children. Please keep The Good Witch on the air. Thank you.